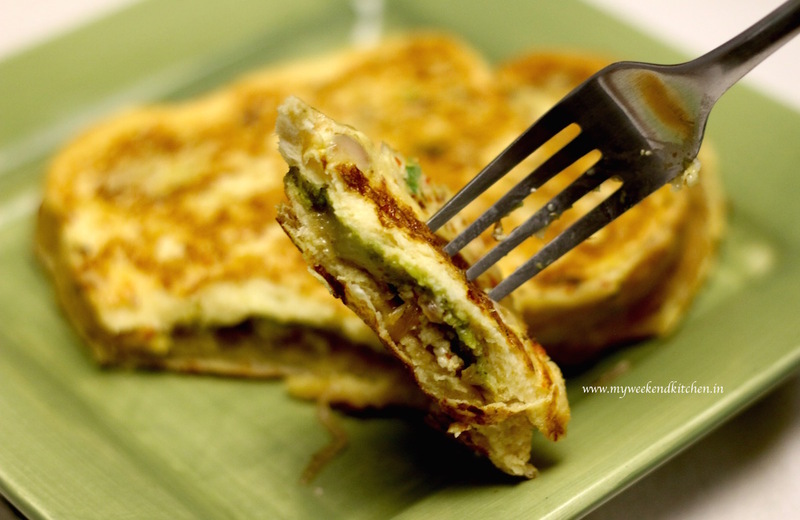 French toast meets Indian bread pakoda and together they make a savoury stuffed French toast. Imagine that spicy paneer/ cottage cheese or potato stuffing sandwich and now dip it in egg batter and pan fry in butter. 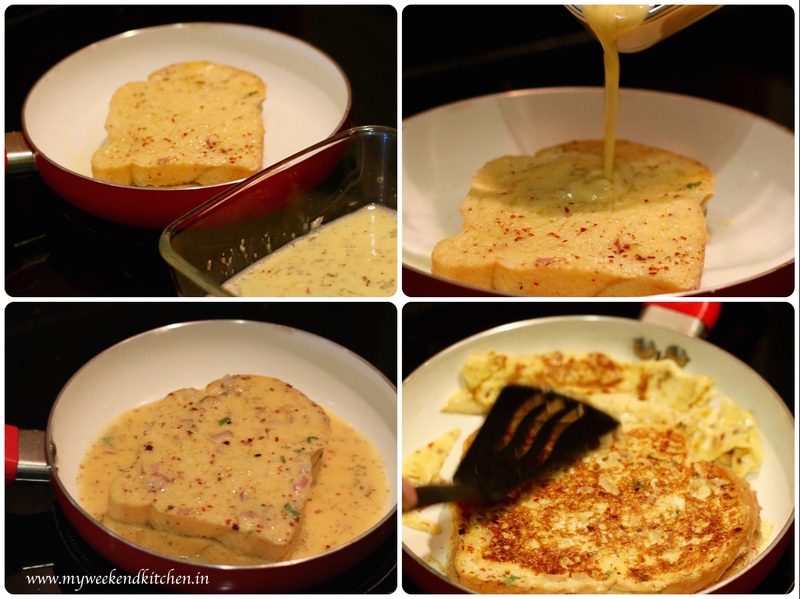 The possibilities of experimenting with flavours in stuffed French toast are endless. For the step-by-step pictures of this stuffed French Toast, I’ve used a spicy cottage cheese filling, but we also made them with sweet cream cheese stuffing and spicy potato stuffing. My personal favourite is the one with spicy potato stuffing. It’s a great combination of continental and Indian breakfast tastes. Why call it a French pakoda? Because it is a perfect cross between the French toast and the Indian Bread Pakoda. 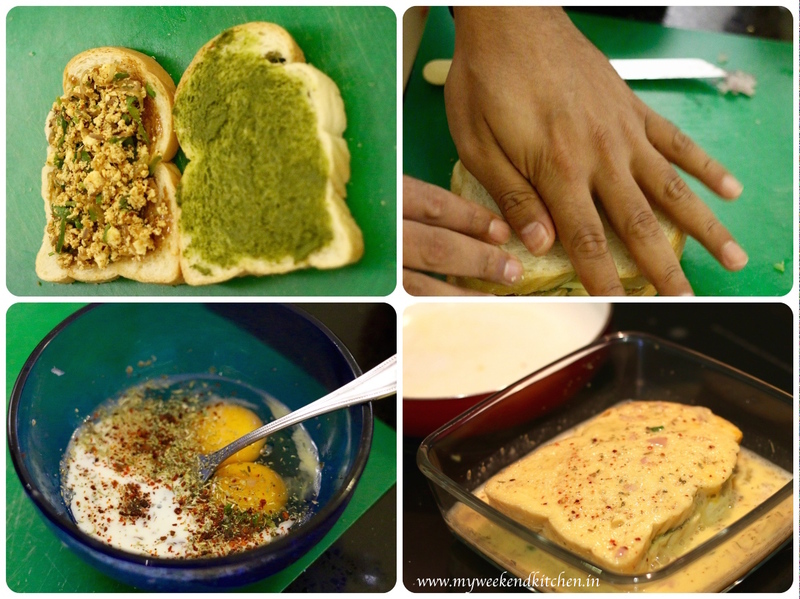 We start with a bread pakoda recipe and end with that of French toast. Add a fruit smoothie and together they make a filling breakfast/ brunch menu. Heat oil in frying pan. Sauté chopped green chilli, onion and capsicum in oil for 2 mins till the onion just starts to turn soft. (Keep aside just about 1 tbsp of chopped onion and green chilli aside for the batter) Add crumbled paneer, salt and pepper. Mix well and remove from heat. To make potato stuffing, simply grate boiled and peeled potatoes and season with salt, pepper and some chaat masala. For each stuffed French toast, take 2 slices of bread. Spread a tbsp each of green chutney and tamarind chutney on the slices. Add about 2-3 tbsp of paneer stuffing in the centre of one bread. Top with a cheese slice and press down the other bread slice. This is the basic preparation for bread pakoda, which is traditionally then coated with spicy gram flour batter and deep fried. To make the egg batter, beat together 2 eggs, 1 tbsp milk, a little finely chopped onion and green chilli, salt, paprika and 1 tsp of dried oregano; in a bowl. Empty in a flat bowl, big enough for the sandwich. Dip the prepared bread pakoda into the egg batter and let each side soak in the batter for about 20-30 secs. Heat a flat pan and add a knob of butter. When the butter starts to melt, put the soaked bread pakoda. If you have batter left, you can pour it on the bread pokoda in the pan. 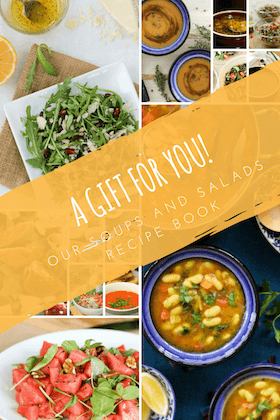 It will give you bits of omelette with the French pakoda. Cook each side for about a minute till it turns golden brown. Serve hot. With both spicy and sweet chutneys inside, the French pakoda doesn’t need any ketchup or chutney on the side. Note: To make the basic sweet cheese filled French toast – beat together 2 tbsp of cream cheese with 1 tsp sugar and ½ tsp vanilla essence to make the stuffing. In the egg batter, instead of salt, paprika and oregano, use sugar to taste. Rest of the process is the same. You can also add berries and other fruits to the cheese.